About us - your systems provider for hose assembly manufacturing : UNIFLEX of America LLC. In 1972, the machine builder and graduate engineer Peter Schröck established Uniflex-Hydraulik GmbH in Frankfurt/Main. Owing to pioneering innovations and extraordinary product quality, the flourishing enterprise soon developed into a global provider of machines for hose production. 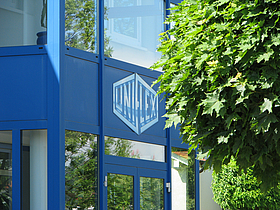 Uniflex-Hydraulik GmbH became a member of Freiherren Waitz group in 1992. This laid the foundation for further growth: in 1996, the company occupied a new, larger office and production building in Karben, 10 km north of Frankfurt. The subsidiary UNIFLEX of America LLC. with its present registered office in Schaumburg near Chicago, Illinois, was established in 1998 to support the markets in the Americas. In June 2004, UNIFLEX opened a subsidiary in Singapore from where our Asia-Pacific customers are served. We are also represented by offices in Tangerang/Indonesia and Shanghai/China since 2007 and 2009, respectively. Today, after 40 years , UNIFLEX is a system provider in hose production – from workshop equipment to production plants. Innovative and reliable as well as durable hose crimpers, cutting machines, pin prick tools, skiving machines, marking tools, test systems, software and cleaning machines have been and are being developed and marketed in close cooperation with leading hose manufacturers and users. Formation in Frankfurt/Main by Dipl.-Ing. Peter Schröck: Pioneering innovations and excellent product quality soon make Uniflex-Hydraulik GmbH a global leader. Acquisition and considerable expansion and modernization investments by Freiherren von Waitz group. Construction of the new company building in Karben with up-to-date production and office premises - 10 km north of Frankfurt, with optimum transport connections. Subsidiary UNIFLEX of America LLC (Plymouth / Minnesota / USA) to support markets in the Americas. Formation of UNIFLEX CNC Metalltechnik GmbH in Grossalmerode near Kassel as supplier for the production of standard and specialized dies. Formation of UNIFLEX Spezialmaschinenbau GmbH as an international cooperation with the fluid technology experts Clavel and REM. Subsidiary UNIFLEX Hydraulik Asia-Pacific Pte Ltd (Singapore) to support markets in the Asia-Pacific region. Subsidiaries UNIFLEX-Hydraulik Trading (Shanghai) Co., Ltd. in China to be set up for the growing Asia business. Establishment of UNIJOIN Machinery (Shanghai) Co., Ltd. as production and assembly company for the local market. Establishment of UNIFLEX Hose Assembly Machines India Pvt (Bangalore) to support markets in the India region. Opening of UNIFLEX-Hydraulik Latin America a branch office which covers the countries of Latin America .